With the benefit of visionary and generous voters, our county has strong local support for transportation, including the most recent sales tax, Measure R, which passed in 2008 at the beginning of the Great Recession. This measure and past voter support makes possible the construction we see today, and keeps Metro fares among the lowest of any major transit system in the U.S.
Line Subway and the Regional Connector. Metro also received the two largest TIGER grants awarded in California: more than$22 million for the Eastside Access Improvement Program and the Willowbrook/Rosa Parks Station that serves the Blue Line, Green Line and numerous bus lines. Together these agreements – which were aggressively pursued by transit agencies across the country – represent another historic vote of confidence in Metro by the federal government. As we celebrate the 25th anniversary of Metro Rail , it’s with great pleasure and high expectations that we look toward a future of rail, bus and car, bike and pedestrian travel – working together to create a new mobility for our region. At the same time, I’m honored to take the helm of Metro and committed to providing excellence in service and support along with our 10,000 employees. With a balanced budget of $5.6 billion for Fiscal Year 2016 (FY16) and five rail lines under construction, Metro is an economic engine. It’s also an engine of change. Two Metro Rail projects – the Metro Expo Line extension to Santa Monica and the Metro Gold Line Foothill extension to Azusa – are in the final stages of construction and promise improved mobility and connectivity in the next year, as we continue working toward a balanced transportation network for all of Los Angeles County. Our budget includes $2.1 billion in capital projects, which encompasses three of the five rail projects on our construction roster: the Crenshaw/LAX project, the Regional Connector and the Westside Purple Line Subway Extension Secion 1. It also includes an operations budget of $1.5 billion, along with $1.4 billion in subsidy funding for local communities, which supports local transit operators and other locally selected mobility tools for the 88 cities and unincorporated areas of our massive and diverse region. There’s a lot going on here and the budget is a vehicle for advancing Metro’s mobility program on many fronts. As further evidence that we’ve earned the trust and confidence of the U.S. Department of Transportation, the Federal Transit Administration (FTA) has authorized us to begin engineering on Phase 2 of the Westside Purple Line Subway from La Cienega Boulevard to Century City. Breaking a 30-year impasse on getting rail transit into Los Angeles International Airport (LAX), we continue our partnership with Los Angeles World Airports and the City of Los Angeles to determine the best connections to serve Metro-to-airport travelers. We know that construction projects can disrupt communities, so to improve life for businesses near Crenshaw/LAX Light Rail construction, we launched the first-of-its-kind, multi-faceted construction mitigation program. Among the components are the Eat, Shop, Play campaign, which is designed to increase business and community involvement and interaction along the corridor; the Business Interruption Fund for financial support of small mom-and-pop businesses affected by construction and the Business Solution Center to offer marketing and other technical assistance. These models are also being applied to communities and businesses along the Westside Purple Line Extension and Little Tokyo area of the Regional Connector. Let us not forget that Metro Rail does not fly solo. It works hand-in-hand with 2,200 buses covering 170 bus routes and nearly 16,000 bus stops. The buses are the worker bees of our system and to ensure their reliability and safety, 550 Compressed Natural Gas (CNG) New Flyer buses have entered service this year to complement our existing fleet and make travel easier for wheelchair patrons who depend on public transit to get around. Our bus on-time performance has never been better. From an on-time performance low of 65 percent in 2007 moving towards an on-time high of 80 percent, our buses are running more efficiently, even on Southern California’s traffic- congested streets. Our buses are also cleaner, according to our customer surveys and feedback from our Service Council members. In terms of reliability, Metro buses now travel many more miles before needing mechanical assistance than they did in 2008: from 3,000 miles in 2008 to more than 4,500 miles in January 2015. That all adds up to better service for our customers. Maintaining buses in good repair is an excellent example of careful asset management and fiscal responsibility – two principles that must influence everything we do. It also is closely aligned with our number one priority at Metro: safety and security. With those matters in mind, we are in the midst of a multi-million dollar overhaul of the Blue Line – our oldest rail line, which turned 25 in summer 2015 – that will include new and upgraded rail cars, track and power system improvements,newpaintandlightsandotherstationamenities. The renovation is spanning several years and will bolster reliability, comfort, safety and security for our customers. Metro channels significant funding to Metrolink – our region’s heavy rail commuter system that extends our public transit reach into Ventura, Orange, San Bernardino, Riverside and San Diego counties. Nationally, there is a huge move toward positive train control – technology designed to prevent such disastersastrain-to-traincollisionsandover-speedderailments. Metrolink has completed its Positive Train Control installation and is among the first commuter rail systems in the nation to implement this state-of-the-art technology. 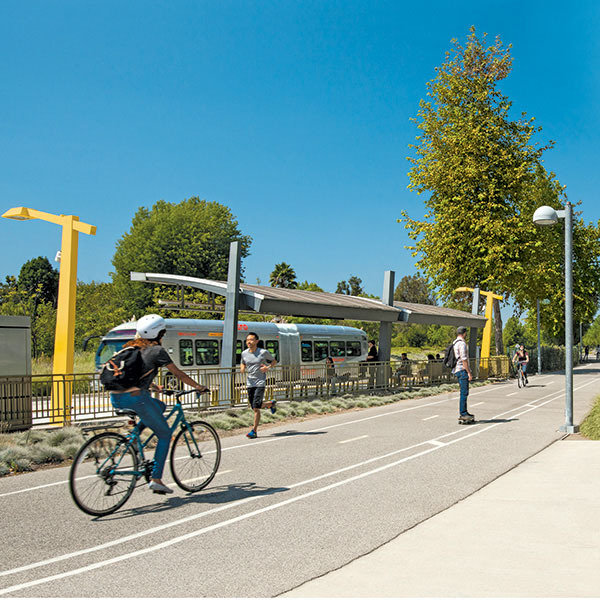 Currently Metro Rail hosts 8,500 bike boarding’s a day and we are working to increase those numbers as part of the First/Last Mile Strategic Plan designed to create bike and pedestrian to transit connectivity. The First/Last Mile plan is in keeping with Metro’s goal of developing a world-class rail system with stations that will be a short distance (three miles or less) from the homes of LA County’s 10 million residents. Also to encourage bicycle ridership to transit, the Metro Board recently awarded an $11 million contract to Bicycle Transit Systems, Inc. to launch a bikeshare program in downtown Los Angeles. The program will provide 1,100 rental bikes at 65 docking stations – many near transit – for low-cost, point-to-point short trips. They are expected to be installed in spring of 2016. Providing another option for commuters facing first/last mile challenges, Metro this spring began a program allowing Zipcar vehicles to park at 10 Metro park-and-ride locations throughout Los Angeles County – another example of transit and car coordination. Our balanced transportation system includes cars and we are working to create greater mobility on our highways, through such efforts as the ExpressLanes congestion pricing program on the I-10 and the I-110 freeways and through highway improvements, including widening and modernization work on the I-5 North, the I-710 South and the High Desert Corridor. Thanks to the voters of Los Angeles County, we’re building a balanced transportation network throughout our region. And we have every reason to be confident that our goal of mobility for all corners of our region is on the road to success. Board Chair Garcetti was elected as the 42nd Mayor of Los Angeles in 2013. From 2001 until taking office as Mayor, he served as the Council Member representing the 13th District, with four consecutive years as Los Angeles City Council President. Board 1st Vice Chair Ridley- Thomas has served as a County Supervisor since his election in 2008. He previously served in the California State Senate, on the Los Angeles City Council and in the California State Assembly. Director Bonin was elected to the Los Angeles City Council in 2013. Previously, he worked on behalf of Westside neighborhoods in senior positions for Council Member Bill Rosendahl, Congresswoman Jane Harman, and Councilwoman Ruth Galanter. Director Butts is in his second term as the Mayor of Inglewood. Prior to becoming Mayor, he served 19 years in the Inglewood Police Department rising to the rank of Deputy Chief, 15 years as the Chief of Police for the City of Santa Monica, and 5 years as an assistant general manager for 6 the Los Angeles World Airport system in charge of Public Safety and Counter-Terrorism. Board 2nd Vice Chair Fasana was first elected to Duarte City Council in 1987. He was re-elected every four years and has served four terms as Mayor. Before becoming a Council Member, Director Fasana worked for Southern California Edison for 3 30 years. Director DuBois was first elected to Lakewood City Council in 2005. She also served as Mayor in 2007-2008 and 2012-2013. Previously, Director DuBois was a Lakewood Planning and Environment Commissioner for 28 years. Director Antonovich has represented the 5th Supervisorial District for nine consecutive terms. Prior to his initial election in 1980, he served as a member of the California State Assembly, rising to the rank of Republican Whip in his third term. Director Dupont-Walker is a resident and activist in South Los Angeles. She is the founding president of Ward Economic Development Corporation, an organization whose mission includes neighborhood, housing, economic and leadership development. Director Knabe has represented the 4th Supervisorial District for five consecutive terms. Before taking office at Los Angeles County in 1996, he served eight years as a Council Member for the City of Cerritos, including two terms as Mayor. Director Krekorian was first elected as a Council Member in 2009. Before his election, he represented the 43rd district in the California State Assembly, serving as the Assistant Majority Leader during the last of his three years in office. Director Kuehl is in her first term representing Los Angeles County’s 3rd Supervisorial District. Previously, she served eight years in the State Senate and six years in the State Assembly. She was Speaker Pro Tempore of the Assembly, founded and directed the Santa Monica College Public Policy Institute and was a UCLA Regents’ Professor in Public Policy. Director Najarian was first elected to the Glendale City Council in 2005 and is currently serving his third term as Mayor. Previously, he was a member of the Glendale Community College Board of Trustees and served on the Glendale Transportation and Parking Commission. Director Solis is in her first term representing the 1st Supervisorial District of Los Angeles County. Prior to taking office in December 2014, she served as President Obama’s Secretary of Labor, a member of Congress, the California State Senate, the California State Assembly and the Rio Hondo Community College Board of Trustees. Director Bowen serves as the District 7 Director of Caltrans and is responsible for planning, construction, operation and maintenance of the state freeway and highway system. She has worked for Caltrans for approximately 30 years. The Los Angeles county Metropolitan Transportation Authority, branded as "Metro", adopted a $5.6 billion, balanced budget for Fiscal Year 2016 (FY16). In FY16, five major rail lines are in construction, with the Expo Line extension to Santa Monica and Gold Line Foothill extension to Azusa opening in summer 2016. The opening of these lines will connect our mountains and beach communities, allowing residents and visitors to experience all that the Los Angeles region has to offer. Construction of the Crenshaw/LAX Transit Corridor, the Regional Connector and the Westside Purple Line extension are already underway. With our continued expansion, our transportation network will connect neighborhoods as never before. Metro, however, is about more than buses and trains. It is about quality of life and livability improvements for a more walkable and bikeable environment. It is about first/last mile connections. It is also about highways, which our sprawling region relies heavily on as part of an integrated and multi- faceted transportation network. In addition to the current year budget focus, Metro is also committed to diversity, sustainability and clear communication. To that end, we are continuously striving toward developing a diverse workforce and working to ensure compliance with civil rights and environmental justice requirements. We are also continuing efforts to sustain our environment, as well as collaborating with all our stakeholders to foster open lines of communication and increased transparency. As Metro builds new rail lines , expands services and enhances service quality, projections show that we will face financial challenges. We can address these challenges by taking small steps now to avoid more extreme measures in the future. It is imperative that we look at how we can continue to live within our means without sacrificing the quality of service for our customers or our ability to deliver on the promises of Measure R.
By spending responsibly, exploring innovative improvements and seeking additional revenue opportunities, we can achieve a state of financial sustainability. Under judicious control, with only a 1% increase over last year’s budget, this budget includes many programs and projects to improve transportation for Metro customers as well as residents and visitors throughout Los Angeles County. to operate in the most efficient, cost effective and customer responsive manner possible. In just five years, Metro’s budget has increased from $3.9 billion in FY11 to $5.6 billion in FY16. As we continue to invest in Los Angeles County’s transportation infrastructure, capital expenses have grown dramatically by $812 million, accounting for nearly half of this $1.7 billion increase. Capital expenses have increased from 34% in FY11 to a projected 38% in FY16 primarily due to Measure R expansion. Operating expenses have decreased from 31% in FY11 to a projected 26% in FY16 through judicious fiscal control. Subsidy funding programs have increased by over $400 million and continue to maintain a proportional share of about 25% of the Total Budget. Congestion management expenses have nearly doubled with the introduction of ExpressLanes. July 14, 2015 marked the 25th anniversary of the Metro Rail Blue line, and the rebirth of rail in Los Angeles County. When the Blue Line opened in 1990, the Metro Rail system consisted of one line, spanning 22 miles and 22 stations. Now, 25 years later, rail has become an integral part of our county’s transit system. The timeline below shows how Metro Rail, Orange Line and Silver Line expansion progressed through the past three decades, as well as how Metro will continue to expand our service in the future. Thanks to voter approved Measure R, the Metro system continues to grow. In fact, all projects are in progress with future openings planned as shown on the timeline. We have many projects in the works, including expansion of the Metro Rail Expo, Gold and Purple Lines. The new Crenshaw/LAX Line will connect the Green and Expo Lines, while the Regional Connector will link rail lines in Downtown LA. With the completion of each of these projects, our expanding rail system will improve access to destinations across LA County. Metro's bus system provides the largest share of public transportation options in Los Angeles County. Local buses provide feeder services by carrying passengers to regional transit facilities, while special services such as rapid and express buses travel along routes designed for customers who require longer trips. Metro Local buses make frequent stops along major thoroughfares. Metro Rapid buses offer limited stops on many of the county’s heavily traveled arterial streets. Metro Express Buses are designed as premium, minimal stop services along the county’s freeway network. Metro Silver Line is a 26-mile line operating between El Monte Station in the San Gabriel Valley and the Harbor Gateway Transit Center in Gardena via Downtown Los Angeles. Metro Orange Line is an 18-mile line traversing the San Fernando Valley along an exclusive right-of-way. Always striving to enhance the trip experience for our customers, we will continue to improve our transit network by frequently evaluating service improvement options suggested by our Service Councils and customers. We are also implementing pilot projects such as all-door boarding to speed up customer boarding, improve service reliability and reduce commute time. With the recent approval to purchase 350 new buses, nearly half of the Metro bus service fleet will have been replaced in less than five years. A total of 900 new 40 foot buses will replace retirement-ready buses, resulting in improvements to the in-service fleet performance. Looking to the future and the changing transportation footprint of Los Angeles County, a framework for a systemwide frequent bus network will be established as the foundation for timely integration with future bus, rail and highway infrastructure projects. The TAP regional smart card system was completed last year after adding its twenty-sixth transit operator, ensuring regional connectivity and ease of travel across multiple transit agencies. In June 2015, the Board approved a new Inter-Agency Transfer (IAT) policy that eliminates paper IATs by requiring all transfers to be made with a TAP card. The new policy also extends the IAT window from 2 hours to 2½ hours. With the implementation of TAP-only IATs in FY16, the region is now poised to fully realize seamless travel across the County as envisioned when the TAP program was launched in 2002, improving customer convenience and shortening boarding times. Looking toward future fare technologies, TAP has led regional meetings and conducted surveys to evaluate possible new fare collection systems and strategies in order to continue efforts for seamless travel throughout the region and increased ease of use. A series of TAP innovations began last year with new ticket vending machine screens that simplify and enhance the TAP customer experience. Riders must feel safe when riding Metro bus and rail services. Efforts are underway to continue to improve Metro’s transit policing program, including a greater use of analytics to identify when and where crime occurs, allowing for more targeted and focused security dispatching. In order to increase law enforcement and security presence throughout the system, a new community policing plan and a new policing contract are currently in development. Various security improvements are being implemented, such as the installation of more cameras on our rail system as well as video screens onboard more buses. In FY16, we are also launching a pilot program on the Silver Line and Red Line to provide WiFi service to Metro customers. This will serve as more than just a customer amenity: the addition of WiFi will also enhance security by facilitating real-time access to the video surveillance system by law enforcement and security personnel. In April 2014, the Metro Board adopted the First/Last Mile Strategic Plan, which seeks to improve access to transit through infrastructure improvements. The plan includes facilitating private sector involvement for bike, car and rideshare services, as well as conducting first/last mile planning on existing transit lines. Metro is currently operating a one of a kind electric vehicle charging network at selected park and ride stations. The network makes use of electric vehicles as an additional first/ last mile option. Due to the uniqueness of this program, Metro has received California Energy Commission funding for both its initial pilot and project follow-up. When the Blue line opened in 1990, the Metro Rail system consisted of one line, spanning 22 miles and 22 stations. Now, 25 years later, rail has become an integral part of our county’s transit system with two subway lines and four light rail lines. As we begin FY16, the Metro Rail system runs a total of 87.7 miles, with 80 stations and more than 150 park-and-ride lots. FY16 marks the highly anticipated opening of the Expo Line extension to Santa Monica and Gold Line Foothill extension to Azusa. This will expand our rail system and add 13 stations to those lines, increasing customer convenience and connectivity as well as mobility across the county. In FY16, we will continue to increase the safety and reliability of our rail system by procuring new vehicles and continuing our focus on maintaining our existing fleet. We will be purchasing 78 new light rail vehicles for the FY16 Expo Line and Gold Line openings, as well as 60 additional vehicles for fleet replacement and future rail service expansion. To ensure that the proper infrastructure is in place to operate our expanded light rail system, two new operating and maintenance facilities will open in FY16. While the Monrovia Division will primarily support the Gold Line and the Santa Monica Division will primarily support the Expo Line, these two new facilities will also increase our capacity for performing light rail vehicle maintenance systemwide. The expansion of our maintenance facilities will make it easier than ever for Metro to focus on maintaining our existing rail vehicles, tracks and systems. We will continue to perform all scheduled component overhauls and mid-life maintenance services for all of our rail lines, including the older Blue Line and Red Line systems. Metro has taken the lead in studies and future construction of major rail projects to sustain and augment the region’s commuter rail system. Continued contribution to both operating and capital funding is planned for the Southern California Regional Rail Authority, also known as Metrolink. FY16 regional rail capital projects include funding for Bob Hope Airport Pedestrian Bridge, Van Nuys Second Platform, Vincent Grade/Acton and Lancaster Stations, Doran Street Grade Separation, Brighton to Roxford Double Track, Raymer to Bernson Double Track and Southern California Regional Inter-connectivity Program (SCRIP), which will increase Union Station commuter rail capacity. In FY16, we continue our commitment to keeping our system in top form by targeting $392 million to maintain our existing bus and rail system. In addition, $51 million is directed to safety and security capital projects, which include technology enhancements such as cameras and video screens on our buses and at our rail stations. Finally, $26 million will be dedicated to capital infrastructure improvements throughout our transit system. Some of the notable projects included in this $469 million total are highlighted below. For a detailed listing of operating capital projects, refer to pages 64-69. Metro’s Board has established a policy requiring that our assets be maintained in accordance with manufacturer recommended standards and that the Board be notified of any instances of deferred maintenance. Accordingly, more than $392 million and 150 projects are planned in FY16 to enhance our maintenance capabilities and to keep our assets in a state of good repair. Asset maintenance planned in FY16 to benefit bus and rail modes are nearly equal with budgets of $195 million and $163 million, respectively. The method for allocation of maintenance resources between modes factors in the age and use of existing assets along with anticipated new assets. The asset improvement and maintenance plan for the Metro Rail system will result in improvements to all lines with emphasis on the oldest rail lines. Refurbishment of Blue Line stations that is already in progress will continue, as will the ongoing rehabilitation of the overhead catenary system. On the Red Line, heavy rail vehicle midlife overhauls, new vehicle procurement and rail car component replacement are among the projects that will work toward our goal of continuously improving our assets. Various security facility improvements are planned at select Metro locations to provide a greater security presence on our transit system. In addition to improvements to physical security, Metro will also continue with upgrades related to Payment Card Industry (PCI) compliance standards. These changes will increase the protection of financial information for customers using bank cards to purchase fare media with our TAP fare collection system. In FY16, a pilot program is being launched to install and test a platform track intrusion detection system that will provide early warning signs of potential hazards on the tracks of select rail stations. The system will alert rail operators and our Rail Operations Center of persons or objects detected in the rail right of way in order to reduce injuries, fatalities and other track intrusion incidents. We are also continuing with projects that will improve access to our transit system, such as the Universal City pedestrian bridge and Red Line to Orange Line underpass. Once completed, these designated pedestrian thoroughfares will enhance safety by providing a way for customers at Universal City Station and North Hollywood Station to avoid crossing vehicular traffic. Planning, developing and operating the region’s transportation system is an energy intensive endeavor. In order to decrease Metro’s dependence on the use of natural resources, we have implemented an extensive set of environmental and sustainability initiatives. In 2015, we completed an agencywide rollout of the most comprehensive Environmental Management System (EMS) in the transit industry. EMS is a set of operational procedures designed to ensure compliance with federal, state and local environmental regulations, as well as to facilitate environmental stewardship at all Metro facilities. Metro’s EMS has been rated by an independent Columbia University study as the best International Organization for Standardization (ISO) 14001 certified transit EMS in the country. Initiatives and projects developed and implemented through the EMS have resulted in more than $2 million in annual cost savings. More importantly, the EMS has shifted the paradigm for how our frontline staff participates in and initiates environmental compliance efforts. Metro will also continue retrofitting our existing facilities to ensure a safe and environmentally sound workplace. The Metro Headquarters building has already received Leadership in Energy and Environmental Design (LEED) Gold certification and these efforts continue with our transit operations divisions. Ultimately, our goal is to obtain LEED certification for all Metro facilities and to achieve 33% renewable energy use by 2020. Metro has adopted a policy for the exclusive use of natural gas powered buses, as well as a plan to procure biomethane. Once the biomethane procurement project is fully implemented in 2016, Metro will have the ability to offset agencywide carbon emissions by about 45%. We are committed to complementing these strategies with a zero emissions bus fleet and have purchased five new zero emission electric buses that are currently being tested. To further decrease Metro’s carbon footprint, electric vehicle chargers at select rail stations and divisions are being installed to encourage electric vehicle usage by both customers and staff. Metro’s sustainability implementation plan addresses waste management, energy conservation, water conservation and greenhouse gas reduction. We continue to implement our Water Conservation and Management Policy through the Water Action Plan. Metro has voluntarily achieved more than 28% water use reduction between 2013 and 2014, which translates to an annual water consumption reduction of more than 100 million gallons. fees and installation of new surface material in parking lots to demonstrate the effectiveness of particulate filtration. In addition to providing transit services and improving the highway network in Los Angeles County, Metro administers and sponsors several programs designed to reduce traffic congestion, increase safety and improve air quality throughout the county. These measures contribute to a more efficient transportation system that benefits all commuters. A brief description of each part of Metro’s Congestion Management Program is shown below. Metro Freeway service Patrol provides assistance to stranded motorists and clears traffic accidents on freeways throughout the County. These services are provided free of charge. Metro ExpressLanes utilizes congestion pricing on high- occupancy toll lanes on the I-110 and I-10 freeways, providing a faster transportation option to motorists. Tolls are higher when there is more traffic and lower when there is no traffic. The Kenneth Hahn Call Box Program provides telephones along Los Angeles County freeways for use by motorists in need of assistance or in times of emergency. The Regional Integration Of Intelligent Transportation Systems (RIITS) is a real-time traffic data monitoring network used by emergency services, transit agencies and third-party users throughout Southern California. Metro Rideshare Services incentivizes ridesharing by partially subsidizing vanpooling and connecting commuters to other subsidy programs as an alternative means of transportation besides driving alone to work. The Metro ExpressLanes project continues to successfully improve freeway traffic flow by providing enhanced travel options on the I-10 and I-110 freeways. For FY16, $62.2 million in toll revenues are expected to be generated to operate, maintain, improve and reinvest in those corridors. Toll revenues in excess of the program costs are required by Board policy to be reinvested into the I-10 and I-110 transit corridors. Since the program’s inception, excess toll revenues have funded bus service enhancements for Gardena Transit, Foothill Transit, Torrance Transit and Metro. In order to incentivize carpooling, vehicles with multiple occupants are not charged a toll. Approximately 66% of all trips on the ExpressLanes are toll free. The popularity of the program is enhanced by this toll-free option: in FY16, ExpressLanes accounts in Los Angeles County are expected to increase by 10% from 350,000 to 385,000. Sales tax and Transportation Development Act (TDA) revenues are expected to grow at 3.2% over the FY15 levels. This growth rate is consistent with projected receipts for FY15 and is also in line with various outside economic forecasts. Fare revenues are expected to increase by 7.1% over the FY15 budget reflecting the Gold Line Foothill extension to Asuza, the Expo Line extension to Santa Monica, and a full year of the Board approved fare restructuring. New State Transit Assistance (STA) revenues for bus and rail operations and capital in FY16 are expected to be $105.7 million regionwide representing a 1.0% increase over the FY15 budget. Capital financing, including grant reimbursements, sales tax carryover and Transportation Infrastructure Finance and Innovation Act (TIFIA) loan drawdowns will total $2.3 billion in FY16 in line with planned expenditure activity. ExpressLanes toll revenues are expected to come in at $62.2 million for FY16. This represents a 102.6% increase over the FY15 budget. This increase reflects the continued popularity of the ExpressLanes. Cap-and-Trade Low Carbon Transit Operations Program funding for Metro totals $3.9 million. Advertising revenues of $22.5 million (based on fixed guaranteed amount) and Federal CNG fuel credits of $19 million are programmed to fund operations. The opening of the Gold Line Foothill Phase 2A extension to Azusa and Expo Line extension to Santa Monica will expand our rail system and increase rail revenue service hours by 6.5 percent from FY15. To ensure that infrastructure is in place to support our growing rail operations, two new operation and maintenance facilities will be opened in Monrovia and Santa Monica. For represented employees, a wage increase of at least 3% is included as dictated by negotiated provisions. To be consistent with this rate, a similar wage increase was included for non-represented employees. (1) Sales tax and TDA revenues for FY15 Budget represent reforecasted levels based on FY15 YTD Quarter 3 information from the State Board of Equalization (SBE). (2) Other Revenues includes lease revenues, vending revenues, film revenues, county buy down, auto registration fees, transit court fees, CNG credits, investment income & other miscellaneous revenues. (3) Includes grant reimbursement of preventative maintenance operating capital cost, highway capital grants and major construction grants. (4) Represents use of bond proceeds and sales tax revenue received and unspent in prior years. (2) Measure R Rail Operating funding is restricted to projects beginning rail operations after Measure R passage. (1) Combines related program costs regardless of Generally Accepted Accounting Principles (GAAP) reporting criteria used for fund financial presentation on pages 38-39 and 48-49. (2) Represents subsidies to Municipal Operators, Metrolink & Access Services Incorporated (ASI). Metro’s congestion Management programs are designed to tackle the ever present issue of traffic congestion in the region, whether by assisting broken down vehicles, clearing traffic accidents, promoting ridesharing or providing toll-based alternatives to waiting in traffic. Metro also sponsors the Regional Integration of Intelligent Transportation Systems (RIITS), a real-time traffic data monitoring network used by emergency services, transit agencies and third-party users throughout Southern California. The investment in public transit and highway infrastructure made possible through Measure R and other funding partners has benefited the region not just in terms of improved mobility, but also with increased economic activity and job creation. This is no small feat considering the worldwide economic downturn experienced at the time when Measure R was approved. Metrolink is the sole recipient of funding from the Measure R 3% component, which is eligible for operations maintenance, and expansion of the commuter rail system. These funds have helped finance various safety and system improvements, including the installation of the much needed positive train control system. Local jurisdictions in the county receive funding through the Local Return sub fund, which is allocated based on population. As specified in the Measure R Ordinance, these funds must be spent on transportation projects and infrastructure improvements such as major street resurfacin and rehabilitation, pothole repair, left turn signals, bikeways, pedestrian improvements, signal synchronization and transit. In addition, the Bus Operations sub fund is allocated to Metro and other transit providers in the region based on the Formula Allocation Procedure in order to fund countywide bus service operations, maintenance and expansion. Metro is the Transportation Planning Agency for Los Angeles County. In this capacity, Metro plans, programs and administers various local, state and federal funds for the operating and capital needs of the county’s transit systems and various transportation improvement programs. In FY16, nearly $1.4 billion in subsidies is going right back into Los Angeles County. Funds received by municipal transit operators, Access Services and Metrolink are used by those agencies to provide transit services, ensuring mobility throughout the region. Funds received by the 88 cities and unincorporated areas of Los Angeles County are used to invest in transportation improvements at the local level, such as public transit, streets and roads, bikeways and pedestrian improvements in their areas. Access Services (Access) fulfills the provision of the Americans with Disabilities Act (ADA) mandated complementary paratransit services on behalf of Metro and 43 other transit agencies in Los Angeles County. Access is predominantly funded with federal Regional Surface Transportation Program and Proposition C 40% Discretionary sales tax revenue funds allocated by Metro. As required by the ADA, Access is available to individuals who are determined to be ADAeligible for any trip within Los Angeles County that originates and terminates within ¾ of a mile of a fixed route bus line or rail station. Access provides service during the same hours of operation as the fixed route operators in Los Angeles County. Access is a shared ride service that uses a combined fleet of small buses, mini-vans and taxis, and provides more than 3.1 million trips per year to more than 163,000 qualified customers with disabilities in a service area of more than 1,950 square miles. Metrolink participates in Access’ Free Fare program which allows Access’ eligible customers with a valid Access identification to ride Metrolink free of charge within Los Angeles County. In its 23rd year of operations, Metrolink is the commuter rail system operated by the Southern California Regional Rail Authority (SCRRA), a Joint Exercise of Powers Authority, on behalf of the transportation agencies in Los Angeles, Orange, Riverside, San Bernardino and Ventura counties – the member agencies. Spanning 535 route miles over seven lines with 59 stations, Metrolink expects to operate 171 weekday trains and 90 trains on weekends. Downtown’s Los Angeles Union Station represents the destination of over 67% of all Metrolink riders, and in FY16, the Metrolink system will be the first commuter rail agency in the nation to initiate the operation of a Positive Train Control system. Member agency contributions to Metrolink represent the net subsidy requirements of operating the system over and above all system generated revenues such as fare and freight railroad reimbursements. Metro provides approximately 51% of all Member Agency operating contributions to the SCRRA. The Exposition Metro Line Construction Authority (Expo) was created by the State Legislature under Public Utilities Code Section 132600, et seq., for the purpose of awarding and overseeing final design and construction contracts for completion of the Exposition Metro Light Rail project from the Metro Rail Station at 7th Street and Flower Street in the City of Los Angeles to downtown Santa Monica.